A news article on CNN Money warns that a growing number of doctors in independent practices are barely able to pay their bills and many are thinking of leaving practice altogether. Doctors especially fear the pending cuts to Medicare, which Congress keeps patching every few months with a “doc fix.” But other reimbursement cuts and rising practice costs already are putting many of them in a cash crunch. Dr. Mike Gorman, a family physician in Logandale, Nev., told CNN Money “Doctors don’t want to talk about being in debt” but said that if he is going to keep his practice running and pay his five employees, he must change strategies to deal with his rising business expenses and falling reimbursements. The future is here sooner than we had feared. Chief Medicare actuary Rick Foster warned of exactly this scenario when he predicted that if the $575 billion in cuts to Medicare in ObamaCare take effect, as many as 40 percent of doctors and others treating Medicare patients would be forced to go out of business or stop seeing Medicare patients. If we are going to keep committed, experienced physicians from retiring early or taking another job where they stop practicing medicine, we must free doctors from oppressive price controls and expensive regulations that are choking their practices. The law is doing exactly the opposite, as I argue in an article, “ObamaCare sends costs skyrocketing.” I remind people that the president repeatedly promised the American people he would cut a typical family’s premium $2,500 a year before the end of his first term. But costs are rising now even faster than before the law was enacted in March 2010. A Kaiser Family Foundation survey found that premiums for a family policy topped $15,000 a year in 2011, increasing an average of $1,300 in the last year — three times faster than the year before. The many ObamaCare mandates to come will raise premiums even further. Health insurance is consuming a bigger share of employer budgets, pre-empting pay raises and pushing higher costs onto employees, the Kaiser survey found. The premium increases reflect the law’s early provisions, such as “free” preventive care and adding “children” up to age 26 to their parents’ policies. Consumers may like these features, but they come at a cost. A number of factors contribute to rising health costs, but the mandates, taxes and regulations in the health law are accelerating the trend. The $500 billion in new taxes in the law will further fuel premium increases, including a new tax on health insurance that took effect January 1. Analysts at the Congressional Budget Office estimate that the average policy for those who get health insurance through the workplace will cost $20,000 a year for a family of four by the year 2016. Millions of Americans who buy insurance on their own will pay at least $2,100 a year more for their policies than if the law had not passed, CBO says. And obtaining health insurance will not be optional since everyone will be required to have coverage or pay a fine. Facts are stubborn things. The American people know their health costs are rising, despite Sec. Sebelius’ claims to the contrary, and ObamaCare will only make it worse. “Democrats managed to get themselves the worst possible result: a law that enflames the opposition on the basis of overreaching federal power but may not work in practice because there is no real power behind it,” he writes. Prof. Starr demonstrated his scholarship on health policy 30 years ago when he wrote The Social Transformation of American Medicine: The rise of a sovereign profession and the making of a vast industry, for which he won the Pulitzer Prize. One quote from that book is extremely revealing in explaining the expansion of political control over the health sector. He details how politicians have been seeking to “gain the gratitude and good will of the sick and their families” in a century-long effort, starting with German Chancellor Otto von Bismarck. Looking ahead in 2012. The health overhaul law may be on the books in the U.S., but the battle is far from over. All eyes are on the Supreme Court, with arguments scheduled March 26-28 and a decision likely by the end of June. We must be prepared for many scenarios: If the court throws out the whole law (least likely), then conservatives, including state leaders, must be ready instantly to gain public support for their replacement strategy. If the court upholds the law or postpones a decision, then the battle will move to the November elections — the last stronghold before the law takes effect. Or it could throw out parts of the law, leaving states, companies, and everyone else in a state of confusion over what’s next. The House would vote again to repeal the whole law as unfixable and then take targeted votes, possibly gaining support by enough Democrats in the Senate who are up for reelection. Ways and Means Chairman Dave Camp has had notable success in gaining bi-partisan support for repealing parts of the law. (Jennifer Haberkorn has a piece in PolitoPro with details. Watch Politico for the article to be posted soon.) Whatever happens, Congress will continue to engage with hearings and repeal votes. Expect much more activity this year in this step-by-step march to repeal. We also submitted comments to HHS complaining about an obscure and complex regulation that threatens to suffocate Health Savings Accounts. For more detail, check out the new paper by HSA guru Roy Ramthun explaining the impact. 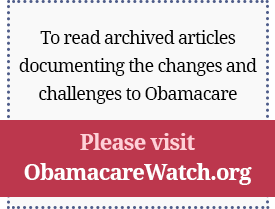 Here is a linkto our comment.HSAs just can’t fit into ObamaCare’s government-knows-best box. If the rules aren’t amended (or the law isn’t thrown out), health insurers will be forced to simply stop offering these policies — policies which offer the best hope of containing costs and giving people incentives to be partners in managing their health care and health spending. This is the year that counts. We need all hands on deck in defense of liberty! Joe Antos of the American Enterprise Institute discusses essential health benefits and what it means for consumer choice, quality of care, and legal challenges to the law. A government report is in detailing the $1.1 billion in early spending on “comparative effectiveness research” (CER) by the Obama administration, and it shows the government already is setting up the systems to direct doctors to practice Washington-approved medicine. For example, a grant for $35 million went to pay government officials to visit doctors’ offices to tell them which treatments the Department of Health and Human Services recommends. A new agency, the Patient-Centered Outcomes Research Institute, will continue to hand out government funding for CER research, with one-fifth of its $500 million annual budget automatically going to HHS to support more government detailing work and “disseminate” government recommended treatment information to doctors. This is particularly alarming because we are entering an era of personalized medicine. Newer drugs, particularly the biologics that can be tailored to an individual’s particular genetic code, are unlikely to be on the government’s recommended lists. Government CER sounds like a progressive solution, but it is actually a frightening move that puts government detailers between patients and doctors and favors one-size-fits-none cost cutting over continued medical progress. The health overhaul law is driving up health-insurance costs for businesses and consumers and will inflict even higher costs on American taxpayers in the years ahead. A Kaiser Family Foundation survey found that premiums for a family policy increased an average of $1,300 in the last year — three times faster than the year before. We needed health reform, but the Affordable Care Act tried to do too much too fast and it is backfiring in its goals. It’s time to head back to the negotiating table and get this right to save consumers, businesses and taxpayers from the law’s calamitous costs. The Ryan-Wyden plan would move Medicare to a more modern defined-benefit program and give seniors a choice of competing plans — plans that would have an incentive to innovate and produce the best care at the best prices. Everyone would be guaranteed coverage, including traditional Medicare, and lower-income seniors would get extra help, including a funded account for out-of-pocket expenses. Prices would be determined by the marketplace, not Washington’s price controls. It also creates a path to a more seamless transition from job-based private insurance to Medicare. Importantly, the Ryan-Wyden plan builds on the structure that has had bipartisan support for more than a decade and which virtually everyone who has studied Medicare reform agrees is the platform to save the program from bankruptcy and from bankrupting the federal government. Nation vs. Nation: Do Countries Compete in Trade, Financial Services and Health Care?